Hamilton Pride Week | 10 Years On | Finding Our History | Mr & Ms Fountain City! Part of finding our history, is brining back what’s been lost. Mr Gay Waikato & Miss Drag Waikato used to be the biggest events on our Social Calander, however have not been able to run since 2012. Well The Hamilton Pride Team want to change that! Miss Drag Waikato was originally known as Ms Fountain City, so to honour our History we present to you the Mr & Ms Fountain City Pageant! This will be the opportunity for our local Queens to showcase their talent, talk about real life passions and issues and show us why they deserve to be crowned Mr & Ms Fountain City 2018. Mr Fountain City which is open to anyone who identifies as male, and is ready to also showcase their talent and make a difference in the Queer Community. With 4 amazing Guest judges, huge prize packages and the chance to be crowned on the 10 year anniversary of Hamilton Pride! Hosed by the Drag Personas of The Hasmilton Pride Exec Comiitee, Diva & Chase ‘N’ Booty, it’s going to be a hilarious evening you don’t want to miss. Further details announced and Entires Open on Monday the 13th of August! Event is completely non-binary, so if you identify as male, female, or gender fluid, nothing’s stopping you from entering either category! This is going to be a night and an event to remember, so make sure you book it in your diary today! 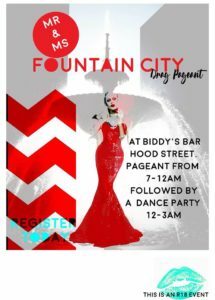 Hamilton Pride Week | Mr & Ms Fountain City | Friday 7th of September | Biddy Mulligans | Hood Street | Pageant 7pm – 12am | Dance Party 12am – 3am | $5 Entry | Drink Specials | See you there!